Book My Event Movie Reviews: Aerial Sightseeing in Hyderabad! What would you do if you had wings? Where would you fly to? Now, if we tell you that we can give wings to your thoughts, would you believe us? Read on further and get yourself ready for a mind blowing aerial sightseeing in your own city! Have you ever wondered how does Hyderabad look from 1000 feet above the sea level? Can you imagine the adrenaline rush you would get at the highest point of excitement by relishing a bird’s eye view of your city, starting from Begumpet and going through Hussain Shah Garden, Buddha Statue, Birla Temple, Char Minar, Golconda Fort, Necklace Road, Public Garden, Central library, City Court, High Court,Hi Tech City and much more? Earlier such tours were seen only in movies shot in Vegas, New York or Dubai. But we have got this memorable experience for you in your city. You can now celebrate a birthday bash up in the sky and impress your guests with a mesmerizing experience in the sky. Gone are the days when a romantic evening was standardized with a candle light dinner and music. You can now take your partner on a beautiful date and sweep him/her off their feet, literally! Be it any occasion, this plane ride is a delight for everyone with its enthralling and fascinating concept. Here’s your chance to do something different with Accretion Aviation. 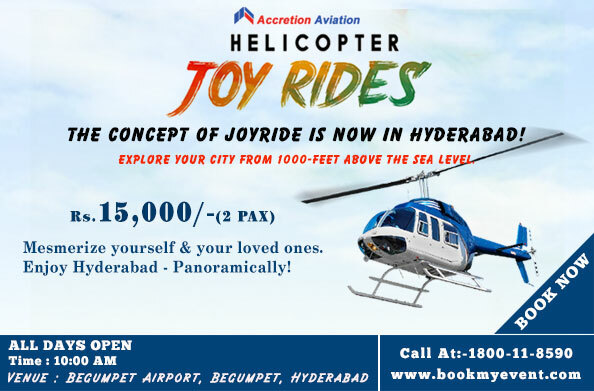 Enjoy the panoramic views of the city of Nizam and its coastline sitting comfortably in your chair up in the sky for a private plane ride for half an hour. You can cherish this dazzling experience in your city Hyderabad at an affordable price of INR 15,000/ (2PAX) for a 30-minute ride. Book your tickets here to get this amazing experience.